Onion, celery and sage are the foundation of classic dressing. 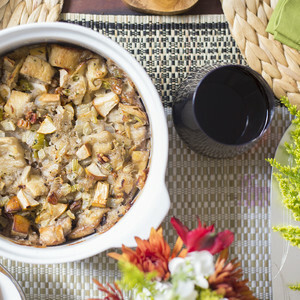 We add another layer of “yum” with earthy pecan and sweet apple in this Thanksgiving meal kit. Onion, celery and sage are the foundation flavors of classic dressing. Our recipe adds another layer of “yum” with earthy pecan and sweet apple (which also adds moisture and richness). A side note about this side dish: Stuffing goes in a bird; dressing is baked in a pan. Dressing is what is found on most Southern tables at Thanksgiving.